How many stools do I need? First, measure the length of your counter. Stools generally measure between 16 – 21 inches wide. For comfortable seating, you should allow approximately 24 inches of seating space for each person. A 72-inch wide counter will seat 3 people, comfortably. 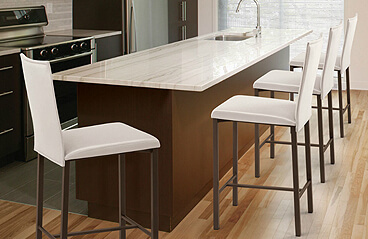 Bar stools with arms take up about 2 inches wider than stools without arms. Note: If the ends of the island are open and there is no wall, you will have slightly more clearing for stools.